Horses have been extremely valuable to humanity throughout history for their strength, durability, labour and adaptability. During the long history between humans and their horses, humanity has come up with some interesting grooming techniques. And one of these grooming techniques is braiding. Horse hair braiding dates back hundreds of years. As horses have become more domesticated, used as one of the main modes of transportation for many years, braiding their manes was the best way to prevent their hair from getting tangled in riding equipment. The practice of braiding was also implemented amongst farmers and labourers as a means of keeping the horse from damaging its own mane or tail by becoming tangled in farming equipment. A braiding grew in popularity, it became a way for people to distinguish horses from each other, with specific braids and positions used to help people differentiate between a prestigious horse and a horse from a lesser ranking, such as those used for battles and hunts. If you came across your horse and it had a singular braid in its hair and you hadn’t put it there, rumour had it that it was left there by a thief who had marked your horse with a braid so that it knew which horse to come back to steal. Naturally, throughout history there have been numerous explanations for events that people don’t quite understand. According to ancient folklore, it was the fairies who began the tradition of braiding. Apparently, these fairies enjoyed visiting horses, so they would drop by the stables in the middle of the night and tie knots in the horse’s manes known as ‘elf knots’. 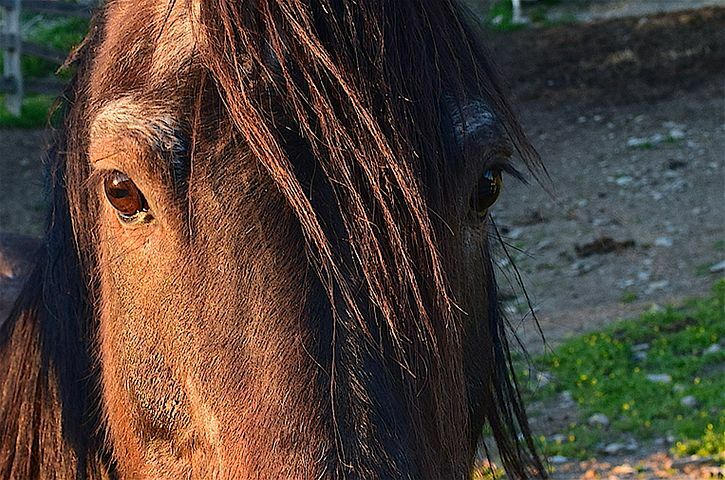 There is an urban myth about ‘Witch Knots’ in horse’s manes that have changed over the centuries, shifting the blame from one mythical creature onto the next. Some believe the origin lies with the ‘Wild Hunt’, an ancient European folk myth. First written down by the Brothers Grimm, The Wild Hunt tells the story of a ghostly group of huntsmen who make a mad dash across the skies on horseback. The story may not sound too scary. But if you saw the Wild Hunt, it was thought to precede some catastrophe such as war, plague, or the death of the one who witnessed it. And for those who are especially superstitious, it would have been pretty scary. Although there are numerous myths about the origins of horse hair braiding, today horse braiding is mainly done to increase the beauty of a horse, keep the mane healthy and show its prestige at shows. Braiding a horse’s mane is especially popular in equine competitions as it is thought to show a high-level of professionalism and care. Braiding also helps to show off the neck of a horse, accentuating its features when competing. Braiding a horse’s mane is the best way to keep the animal’s hair healthy while giving your animal an impressive and professional look. Braiding helps to preserve the health of the horse’s hair. Braiding or plaiting a horse’s hair prevents it from getting excessively tangled up or ensnared in riding equipment. The braids help to keep the mane clean and clear of excess dust and dirt. Historically, braiding a horse’s hair was for function and convenience rather than fashion. Today, braiding is one of the best ways to maintain the health of your horse’s hair, increase the bond between you both and make your horse look more professional for shows or other special events. When done correctly, and properly maintained, horse braiding can be very effective. Just be sure not to braid too tightly, as the stress on the hair follicles can cause damage. If you are planning on keeping the braid in for a long amount of time, it is best to do a looser braid so that your horse has freedom of movement. Button braids are ideal for this and are one of the most popular braiding styles in the United Kingdom. Braiding, as evident throughout history, is both useful and aesthetically pleasing. So, whether you braid your horse’s hair for convenience or for professionalism, it is a great way of bonding with your horse and spending some quality time together. If you would like to purchase some grooming products, check out our shop where we sell top-quality grooming products for your horse. We hope that you have found this article useful and that it has been informative about the history behind the horse braid. If you would like to know more about braiding horse hair, let us know in the comments below and we will be in touch.